While we have lived with SRAM and DRAM since the dawn of computing and flash more recently, it is all about to change. The implications for chip design are huge. System architecture has been driven by the performance of memory. Processor designers would have liked all of the memory be fast SRAM, placed on-chip for maximum performance, but that was not an option. Memory had to be fabricated as separate chips and connected via a Printed Circuit Board (PCB). That limited the number of available I/O ports and the rate of data transfers. Over time, space became available on-chip and small amounts of faster memory could be integrated. This faster buffer spawned the designs we have for cache and produced a significant reduction in the number of times a program had to go off-chip for its data. Memory consumes about half of the chip area today, but everything is about to change. Smaller geometries are stretching existing technologies in many ways and new memory technologies are preparing to replace the old. A related story (Powerful Memories) explored some of the changes happening related to the need to reduce power consumption and introduced one new technology that could have a profound effect on memory architectures, namely 3D IC. The migration to finFETs will add another round of complications. “With SRAM you have a problem controlling Vt variability with 16/14 finFETs,” says Dave Lazovsky, CEO of Intermolecular. “Increased threshold voltages come at a cost of power consumption, so you do not get some of the benefits of a conventional shrink. At the same time, new architectures are emerging for non-volatile memories that allow them to depart from the limits of lithography. Instead of getting smaller, they are going vertical and within the next couple of years we can expect to see 3D NAND memories becoming available. This is an important advancement because flash technology does not scale well, with each smaller node delivering shorter lifetime. Almost every type of memory used today is going to be threatened over the next decade by new technologies. It starts with the spinning hard disk, which already is being threatened by NAND flash technology. “It is not just about performance advantages, but economics and the rate of innovations for driving down the cost per bit,” says Lazovsky. But even NAND flash is under pressure from new memory types, most notably Resistive RAM (RRAM or ReRAM). 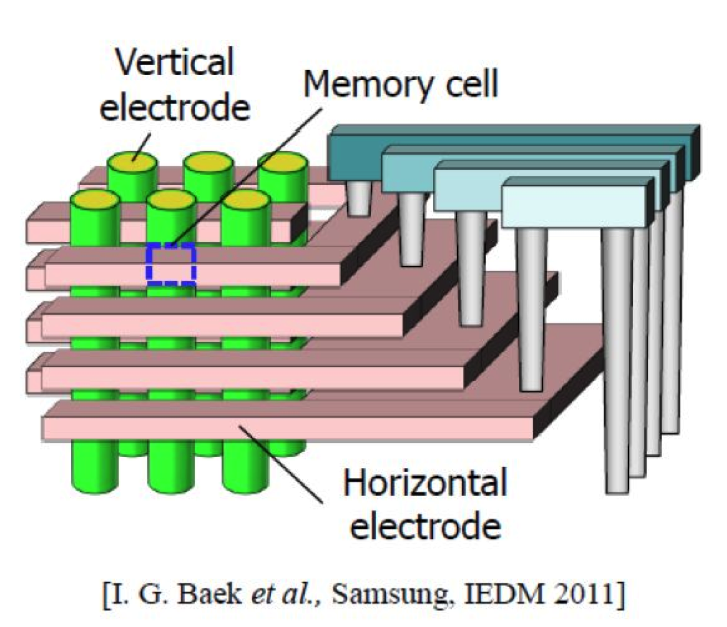 ReRAM works on the concept of the memristor that exhibits hysteresis. This allows a material to retain the last resistance it was set to after power is removed. While most people are looking at cutting-edge applications, it appears that ReRAM may start to creep in via another door. Most consumer products get built in a 40nm or 55nm process technology today. This is the microcontroller market and this is the market that is likely to be fed by an emerging applications market — the Internet of Things (IoT). The IoT market demands smaller horsepower compute engines, such as a microcontroller that has an integrated modem for connection to the Internet. Existing solutions have a small amount of embedded NVM, which is primarily NOR memory. “Once it approaches the performance of embedded RAM,” says Uniquify’s Iyer, “more systems will be designed to ‘execute in place’ out of the NVRAM in the package. True shutdown will be fast. With those kinds of advantages, the question may not be “if” the change happens, but “when.” And when it does, we will be able to rethink many aspects of the way in which we design systems. The day of the big memory change is coming.